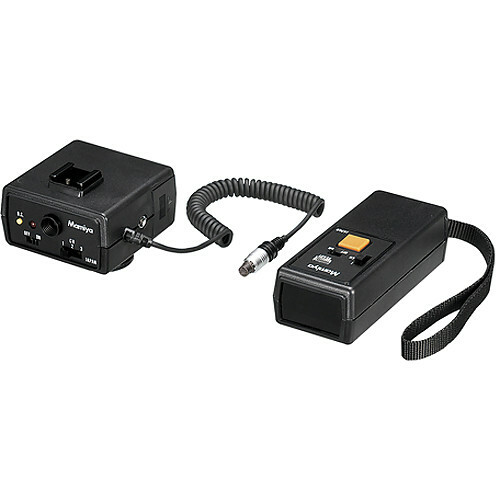 The RS402 Remote Control Set for 645DF Camera from Mamiya includes a transmitter and receiver and enables remote control of shutter release on the Mamiya 645 DF, 645 DF+, 645 AFD and ZD cameras. The remote operates on a near-infrared impulse and offers three channels to minimize signal interference from other remotes. It provides an operating range of 100' when used outdoors without physical interference. The receiver component mounts to the camera's hot shoe mount and connects to the camera's sync port via a coiled cable. The transmitter is large enough to handle easily and provides a wrist strap for security. The transmitter operates on two AA batteries and the receiver on one 9V zinc-carbon battery. Autofocus cannot be controlled with this remote. Mamiya 645DF, 645 AFD, 645 DF+, ZD medium format digital cameras.